What a horrible night it was for Manchester United. FC Barcelona yet again destroyed the defence of Manchester United as Messi became the main villain, scoring two goals for the home side. The total drama of ninety minutes ended as Ernesto Valverde's team qualified for the semi-finals of the elite tournament. On the other hand, the Manchester side, which had an outstanding comeback against Paris Saint-Germain in the round of 16, head back to England with the pain of another defeat at the hands of Barca. Ole Gunnar Solskjaer, who has been recently handed the permanent job of Manchester United manager, opted to play Lindelof as a right-back, while Young started on the other side. Phil Jones and Smalling were the defensive duo for the Red Devils. Hosts Barcelona brought in Sergi Roberto as a replacement for Nelson Semedo at fullback. The match started as United got the first chance as Marcus Rashford tried to chip the Barca keeper. As a result, United missed a bright start as the chipped ball hit the crossbar. It was that little Argentinian, Lionel Messi, who broke the deadlock with a beautiful shot in the 16th minute of the game. One could blame Ashley Young, as the left-back firstly created a pressure moment, and then failed to pass the ball properly, he totally lost his balance off the ball, as Lionel got the chance. A left foot curler was enough to draw first blood. Four minutes later, the Camp Nou crowd witnessed a De Gea howler. This time, Lionel Messi's shot slipped through the gloves of David De Gea. United also created some chances, but there was no finisher as the first 45-minutes ended with a 2-0 score. It was a horrendous night for the Spanish #1 as United conceded the third goal of the night following Philippe Coutinho's stunner in the 60th minute of the game. The journey which started at Old Trafford ended at the Camp Nou as Barca won 4-0 on aggregate. 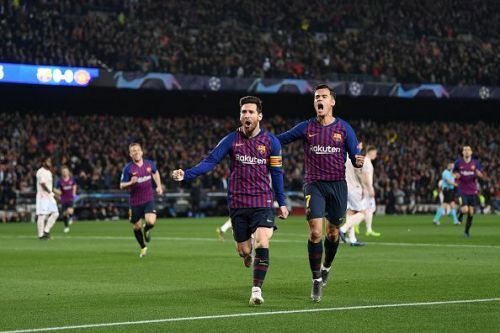 The fans have shared their opinions on social media as Barcelona are in the semi-final of Champions League 2018-19. De Gea: If you want a Kepa you buy yourself a Kepa, if you want a Keeper, you Earn it. Judge Ole Gunnar Solskjaer after 3 seasons of dire football & £400m spent or after 5 years with the same: squad, system and number of trophies won now as before he joined.